For this recipe, preheat the oven to 400 ° F.
Remove the tops and the roots of the beets and peel each one using a paring knife or a vegetable peeler. Evenly cut the beets into 1 1/2-inch slices. Place the sliced beets on a foil lined baking sheets and toss them in olive oil , balsamic vinegar, thyme , salt, and pepper. Place the baking sheet in the oven and roast for 20 to 30 minutes, turning once or twice with a spatula, until the beets are tender. Once the beets have cooked to the desired tenderness, remove them from the oven and continue to cook in a cast iron skillet heated on medium-high heat. Quickly fry the beets with about a ½ ounce of sherry wine, cooking until the liquid has evaporated. Once the beets have been fried. butter each sides of the bread. 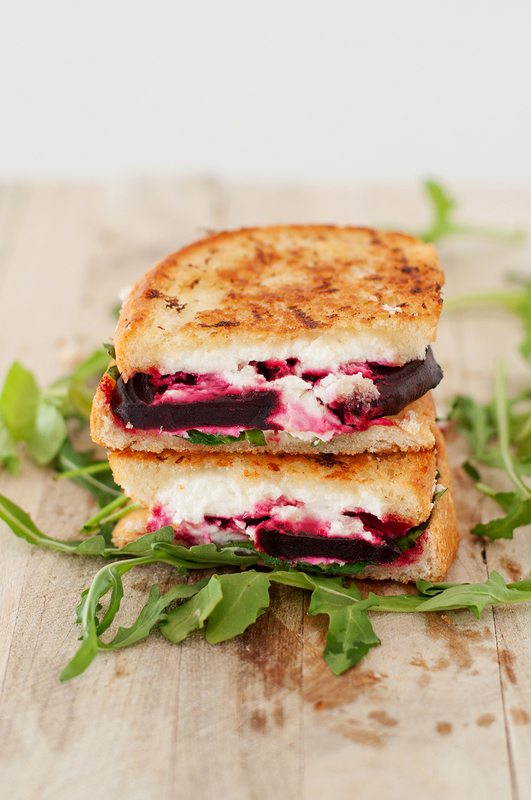 Place the arugula, a little bit of goat cheese, followed by the beets and some more goat cheese. Place the second slice of bread on top of the mass and press the two halves together. Repeat the process with the remaining ingredients. Add another tablespoon of butter to a clean cast iron skillet. Heat the skilled on medium high. Add the sandwich to the skillet and fry on onse side until it is golden brown for 2 to 3 minutes Using a spatula, flip the sandwich and fry the other side until it is golden brown. To serve, place the sandwich on a small plate and then sliced it in half. Chef Chris Cosentino proves here that you can elevate the humble grilled cheese sandwich into something magical with just a few tweaks. His buttery, crisp version is filled with luscious Taleggio cheese, then drizzled with honey and sprinkled with flaky salt and coarsely ground black pepper. It’s so simple, but also jaw-droppingly good. Preheat a large griddle or very large cast iron skillet over moderate heat. Spread butter on one side of each slice of bread and arrange them buttered side down on a work surface. Top 4 bread slices with the cheese. Close the sandwiches, pressing lightly with a spatula, to flatten. Cook the sandwiches over moderate heat, turning once, until golden on the outside and the cheese is melted, 3 to 4 minutes per side. Transfer the sandwiches to plates. Drizzle with honey and season with salt and pepper. Have a knife and fork handy and serve right away. To prepare the ingredients: Rinse all produce. Trim and discard woody bottoms of broccolini, then cut crosswise into ¼-inch pieces. Halve tomatoes. Peel shallot, halve, and thinly slice. Heat 1 tablespoon olive oil in a large nonstick pan over medium-high heat. When oil is shimmering, add pepperoncini, broccolini, shallot, salt, and pepper as desired. Cook, stirring occasionally, until broccolini is tender and lightly browned, 3-4 minutes. Transfer vegetables to a bowl and set aside. Wipe pan clean and reserve for cooking sandwiches. To assemble the grilled cheese, spread mayonnaise over 1 side of bread slices, then flip. Sprinkle half of white Cheddar over plain sides of 2 bread slices, then top with sautéed vegetables and remaining white Cheddar. Finish with remaining bread slices, mayonnaise-side up, pressing lightly. Place pan from vegetables over medium heat. Carefully hover your hand a few inches away from the pan—when you can easily feel heat, add sandwiches. Place a medium heavy pan or large plate on top and cook until bread is golden and cheese is melted, 3-4 minutes per side. Transfer to cutting board. Meanwhile, as the sandwiches cook, in a large bowl, whisk together sherry vinegar, mustard, honey, salt, and pepper as desired. Whisking continuously, slowly add 2 tablespoons olive oil until fully combined. Pat spring mix dry with paper towel, then add to bowl with dressing, along with tomatoes, waiting to toss until ready to serve. To serve, halve broccolini grilled cheese sandwiches on a diagonal and divide between serving plates. Serve with salad on the side.